How is the license code validated? What is the challenge code created from? 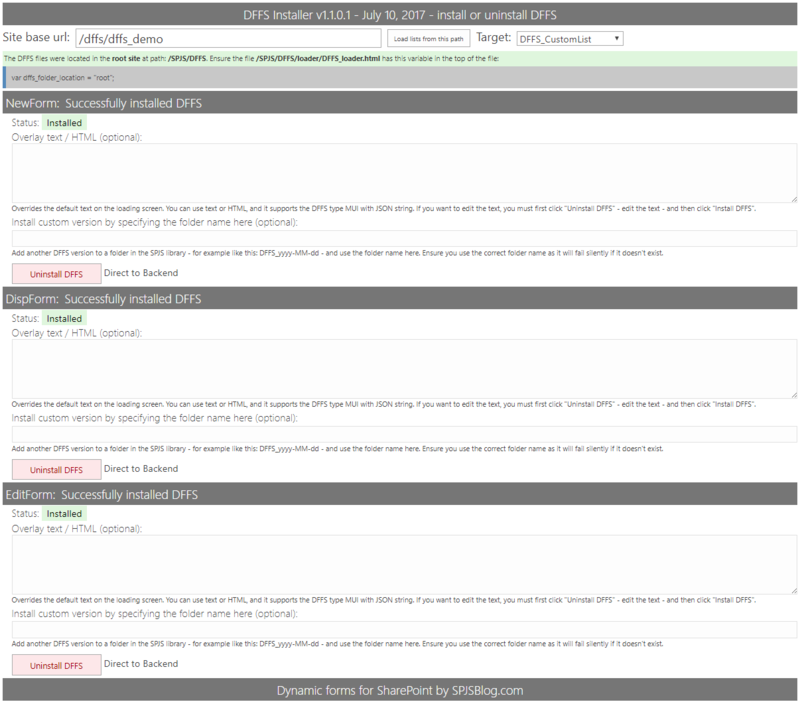 DFFS v4 is compatible with WSS / Moss 2007, SP 2010, 2013 and 2016 – both foundation, server and online 365. The solution is 100% client side, and you can set it up with only “Design” or “Owner” rights to the SharePoint Site. Dynamic Forms for SharePoint is backwards compatibility with DFFS v3.x, but if you are upgrading from an early 3.x version, you must edit each of the forms DFFS configuration after updating to ensure your rules still work properly. This is because some of the updates may have changed how some rules are processed. You should always test a new version in a development site or in a copy of the list to ensure it works as expected. If you decide to test it in a production environment, you must at least back up the configuration before you start. You can export the setup from the “Misc” tab (moved to Export, import and restore tab in later versions). Upgrading from v3.x will require that you reinstall DFFS by using the “local installer” as described below. It will also require that you enter the DFFS config for each form to ensure your rules are correctly set up. This will most likely only affect rules set up on multiselect fields as the configuration for this type of rule has changed to give you a list of the options to choose from rather than a text filed to write the options in. Please look at the “Install custom version” below the “Local installer” section to learn how to install the new DFFS version in parallel with the old version. This will let you upgrade safely by reinstalling one form at the time. If you have trouble, look at the troubleshooting section at the bottom of this document. You find a video installation guide below the step-by-step guide. Create a document library named “SPJS” on the root of the site (or optionally the root of the site collection). Open the the document library in “Explorer view” and drag-and-drop the files from step 1 over on the root of this document library. Please note that you must unzip the files first. If you use SP 2007 you must use the manual CEWP installation method. In this new page, add a ContentEditorWebPart (CEWP). In the “Content link” option in the CEWP, insert a link to the file “/SPJS/DFFS/installer/Installer_CEWP_code.html”. Reload the page and select the list you want to install DFFS in from the dropdown. When you have added DFFS to a list, go to this list and click the “Enhanced with DFFS” link below the form (NewForm, DispForm and EditForm) to start configuring DFFS. The installer will detect any existing JSLink installation or older CEWP installations, and will let you remove this directly to replace it with the new DFFS Installer. If you want to use the installer APP (SP 2013 / 2016 / Online) you can skip to this section. You can “side load” different versions of DFFS. To do this, add a custom version of DFFS with a new folder name – like DFFS_yyyy-MM-dd to the SPJS library, and specify this folder name in the DFFS Installer (currently only the local installer has this feature). This is a great way to upgrade to a new version of DFFS one list at the time. When using the new DFFS Installer, it is essential that the document library is named SPJS, and that the DFFS folder is placed in the root of this document library. This installer if for SP 2013 and SharePoint Online. If you use SP 2010 you must follow the next step “DFFS installer local version”. Unfortunately you cannot get the APP from Office store. It hasn’t been approved in it’s current state because it doesn’t include all the DFFS files in the APP-package (these are located in the host web and cannot be included in the APP web). Therefore you must get the APP from my site, and add it to your APP-Catalog manually. When you have finished the installation and trusted the APP, you will see a button in the “Customize” section of the ribbon menu, or directly in the list heading for the “new experience” layout in all lists and libraries. Please note that the APP is site scoped. This mean you must add it to every site you want to use it. The default location for the SPJS library is in the current SITE. You can change this to refer to the SITE COLLECTION root or the parent of the site you are setting it up in if you change the variable “dffs_folder_location” from “current” to “root” or “parent” in the file “/SPJS/DFFS/loader/DFFS_loader.html” and in “/SPJS/DFFS/vLookup_ListView.html”. If you opt to add the source files in the root of the site collection, you can either add the installer in a web part page in the root site, or in a subsite – linking to the “Installer_CEWP_code.html” file from the “/SPJS/DFFS/installer” folder in the root site. If you change the location of the SPJS document library after you have already installed DFFS from a different location (locally in a subsite), you must use the DFFS installer you set up in the root site to uninstall and reinstall DFFS in the forms in the subsites to ensure they link to the correct files – and also inherits the license code added to the loader file. The loading overlay has the default max time before “This tool forever” shows set to 15000 (15 seconds). This is the method where you add code using Content Editor Web Parts in NewForm, DispForm and EditForm to link to the script files. When you choose this approach, you must edit the files in the “/Sites/YourSite/SPJS/DFFS/CEWP” folder. You must edit the <script> src and the <link> href to point to the files from the “css” and “js” folders in “/Sites/YourSite/SPJS/DFFS/”. You are now finished with the configuration and can start adding the CEWP’s to the forms. Add “DFFS_frontend_overlay.html” above and “DFFS_frontend_CEWP.html” below the form web part in NewForm, DispForm and EditForm using a CEWP and the content link option. If you want to change the text in the overlay, edit the variable “dffsLoaderOverlayText” in the “DFFS_frontend_overlay.html” file. When you have finished the setup, you enter setup for each form (NewForm, DispForm and EditForm) by hitting the “Enhanced with DFFS” link at the bottom of the form. Open the folder where you downloaded the files in your local computer using Windows Explorer (or equivalent), and unzip the files. Open the document library in Windows Explorer from the “Actions” menu in SP 2007. With the two Windows Explorer windows side-by-side, drag the downloaded files and folders over to the “SPJS” document library. If opening in Windows Explorer is not available, you can create the folders manually, and upload one and one file. Optionally you can use SharePoint designer to drag-and-drop the files to the document library. This part applies to the CEWP setup option only. See previous section for the SharePoint 2010 and 2013 DFFS Installer option. You must edit the files “DFFS_backend_CEWP.html” and “DFFS_frontend_CEWP.html” from the “CEWP” folder in “/Sites/YourSite/SPJS/DFFS/”. The best method is to edit the downloaded files on your local computer and upload them again when you have changed them. You find an example on how to add support for using the same CEWP file for multiple lists in SP 2007 in the file “DFFS_frontend_CEWP.html”. Then you must add a WebPartPage to the SPJS document library – for example named “DFFS_Backend”. When this page is added, go into edit mode, add a CEWP and link to the file “/Sites/YourSite/SPJS/DFFS/CEWP/DFFS_backend_CEWP.html” using the “Content link” option. By default, the configuration for the forms you activate DFFS for is stored in a list named “SPJS-DynamicFormsForSharePoint” on the same site as you set up the DFFS_frontend. When you enter the backend, the baseUrl of the frontend site is passed as a parameter in the URL. This way you can have the backend in a centralized location, but still save the configuration for your forms in a list in the site where the current form is located. This will force all lists using this current backend location to share a configuration list. Ensure all users have read access to this location. You can use this option if you have DFFS configured for a list that is part of a site template, and you want all the new sites created from this template to share the configuration for the lists. You can manage the DFFS configuration for all sites created from this template in one location. You cannot add site-specific modifications to a list. If you don’t already have a valid license you want to upgrade, you must buy a license first. Then generate and send the challenge codes to the address you find in the page where you generate the code. You must use DFFS v4.350 or above to be able to generate the challenge code. This step in used only for site or site collection scoped licenses. If you have a Company license of any sort, this step is not used and you can paste the license code you got when you purchased DFFS directly in the “License code” textarea. When you have installed DFFS, go to one of the DFFS enabled forms and open the “License” tab. There you will find a button named “Click this button to generate the challenge code”. You must send both the SITE and SITE COLLECTION challenge codes. 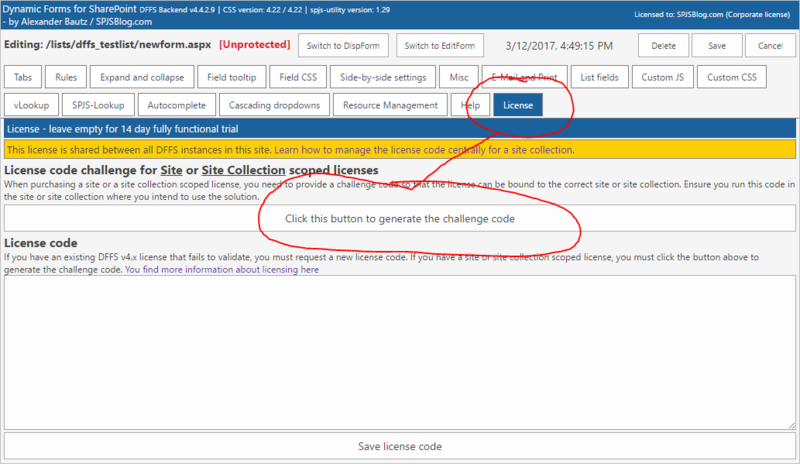 This challenge-response-routine is used to ensure this license is not used in more than one site or site collection (depending on the license type). This platform does not support this validation method. When you buy a license for a SharePoint 2007 site collection you must inform me that you intend to use it in SP 2007, and I’ll generate a “dummy” challenge code. This will let you use the license in SharePoint 2007, but it will fail to validate in SharePoint 2010 and 2013. When you have receive the license code, you paste it in this textarea and hit “Save license code”. If you have an existing license code that fails to validate in a new version of DFFS you can get it updated if you send me the old license code. Please note that a site or site collection license is bound to the site or site collection it was originally associated with. This means you cannot change the challenge code used to generate the code. If you have an older license, please contact me to see what kind of update options you have. This option should NOT be used with a site license. If you buy a site collection license or better you can request a developer license for use in a DEV or UAT environment. This license is fully functional, but has a banner below the form showing that it’s not for production use. I have updated from a previous version and the configuration will not load. Hit F12 in the browser to bring up the developer console. Select “Console” and reload the web page to look for errors. Report any errors to the email address found in the “File a bug reports” section below. When you have filed the bug report, roll back to the previous version of the script while waiting for my response. If you have saved the configuration already, look at the next “problem” below. Go to the configuration list in all site contents. Edit the list item and copy from “lastGoodConfig” to “blob”. Reload the form to verify that it is OK. I have an InfoPath form, or a form customized in SharePoint Designer and I cannot get DFFS to work. Sorry, but DFFS is designed for out of the box SharePoint forms and although you might get it working for a customized form, I cannot help you with it. Nothing happens, or the overlay shows “This took forever”. Ensure you have referred all the scripts correctly. Try the script src or the css href link in the URL field of the browser to verify it is correct. Hit F12 in the browser to bring up the developer console. Select “Console” and reload the web page to look for errors. If you see ‘$’ is undefined you are missing a reference to jQuery. If you receive another error message that you do not know how to handle, please send it to the email address found in the “File a bug reports” section below. It works for me, but not for the other users. Ensure all users have read access to the library where you uploaded the *.js and *.css files. All the scripts are OK, the overlay flashes and disappears, but the button to enter the setup does not show. If you use the old CEWP installation method you must ensure you have added the DFFS Frontend CEWP below the form web part. If you use the DFFS installer, hit F12 to see if you see any errors in the console. If not, try uninstalling and reinstalling DFFS in this form (your configuration will not be affected). The tabs appear as bulleted lists. If you use the old CEWP installation method the CSS file is not loaded. Verify the href to the CSS file in the CEWP. The form flashes “unformatted” before DFFS kicks in. If you use the old CEWP installation method you are missing the “DFFS Overlay” web part, or you have placed it below and not above the form. I try to save the configuration in the DFFS Backend, but receive “ERROR: JSON.stringify is not supported in your browser!” You are using an older version of Internet Explorer. Either update the browser, or use a modern browser like Firefox or Chrome to configure the DFFS solution. If you are using SP2007 and your Internet Explorer version is above version 8, you can hit F12 and change the Document mode and User agent string to 9 or 10. You must switch this back when you have saved the configuration, as SP2007 does not behave well if the Document mode is not set to “Quirks”. The frontend of DFFS is not affected. You get a 404 error on lists.asmx in the F12 Console and DFFS fails to load There is a know incompatibility with Infowise Smart List Pro used ON PREMISES (Office 365 is not affected) because this solution modifies the shared /_vti_bin/lists.asmx file. This is not a DFFS specific issue, but affects all calls to /_vti_bin/lists.asmx (webservice calls). The solution is to uninstall Infowise Smart List Pro. Other issues? Search the forum for a solution, or post a new topic. You find the forum here. Any error messaged from the developer console (hit F12 and select “Console”. Refresh the page and look for error messages). Information about your SharePoint version. Information about your browser version. Other information that may be relevant. Use the forum for general request and “small bugs”. You find the forum here. For priority support, please include the name of the person that holds the license to DFFS. Use the subject “Bug”, and send to alexander.bautz@[put domain her].com. To prevent SPAM you must manually piece together the address with domain “gmail”. Please let me know if you have trouble following this guide. Let me know which part I need to elaborate.